The Government of Finance Officers Association (GFOA) established the Certificate of Achievement for Excellence in Financial Reporting Program (CAFR Program) in 1945 to encourage and assist state and local governments to go beyond the minimum requirements of generally accepted accounting principles to prepare comprehensive annual financial reports that evidence the spirit of transparency and full disclosure and then to recognize individual governments that succeed in achieving that goal. The goal of the program is not to assess the financial health of participating governments, but rather to ensure that users of their financial statements have the information they need to do so themselves. Reports submitted to the CAFR program are reviewed by selected members of the GFOA professional staff and the GFOA Special Review Committee (SRC), which comprises individuals with expertise in public sector financial reporting and includes financial statement preparers, independent auditors, academics, and other finance professionals. For fiscal year ended in 2014, GFOA awarded the Certificate of Achievement for Excellence in Financial Reporting to 4,181 organizations. 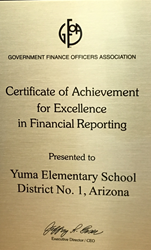 Yuma Elementary School District One was among one of the 86 Arizona school districts to receive this recognition for high standards of financial reporting and accountability. The District has been honored as a recipient for 23 years. The Certificate of Achievement for Excellence in Financial Reporting confirms the District’s commitment to financial accountability and transparency. Recognition through the program can help strengthen a district’s presentation for bond issuance statements and promotes a high level of financial reporting. For more information about the recognition program please visit http://www.gfoa.org/2015-results-certificate-achievement-excellence-financial-reporting-program for the complete list of the fiscal year end 2014 winners. For more information please contact Chief Financial Officer Esperanza Rodriguez at erodriguez(at)yuma(dot)org or (928) 502–4300.